Hugh loves water. Well, warm water anyway. Think hot baths and spa pools rather than the sea and council run swimming pools. To be honest, I’m with him on that. 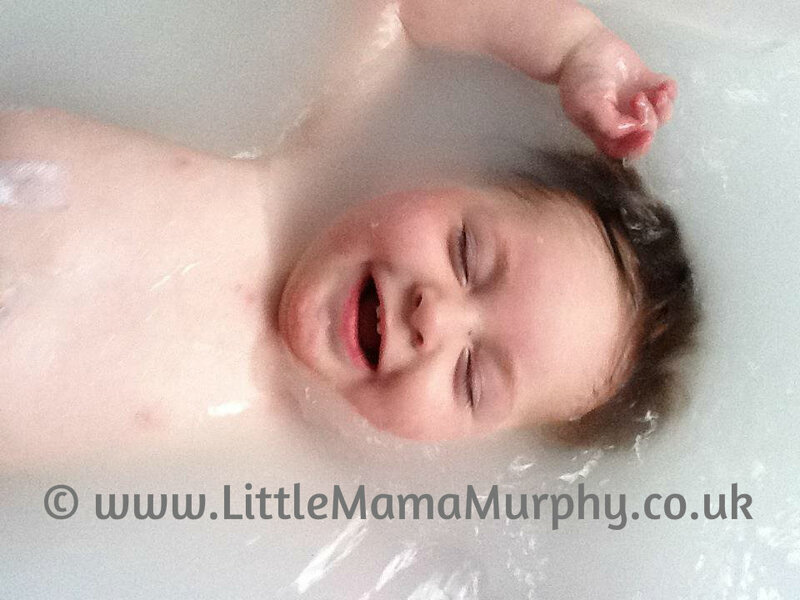 Baths have always been a great source of joy for him but as he has grown they have become harder for him to access and enjoy. Hugh is still unable to sit independently and at 7 he is far too heavy to lift into the bath and support one handed like you might a younger child. 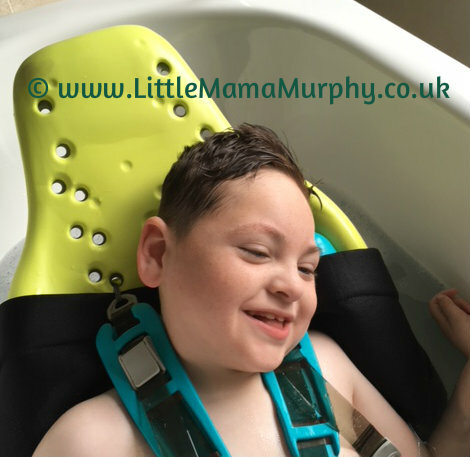 Unable to find a suitable chair that we could use in the bath for Hugh, we resorted to showering him instead – something he absolutely hated with a passion; screaming until he was blue in the face and making himself sick in distress. The truth is, I began to avoid showering him because it upset him (and me) too much. It reached a stage where the poor child was only getting showered after swimming at school (he copes with these showers remarkably better for some unknown reason) and was simply having bed baths or ‘top and tail’ washes at home. 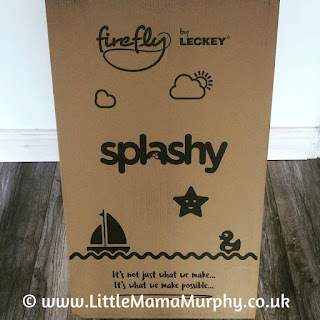 I’d looked at the Splashy by Firefly a number of times online but I wasn’t convinced it would work for us. Hugh has low muscle tone and can’t sit up independently but he does wriggle and move around a lot. Don’t let the fact he can’t sit fool you into thinking I could strap him in somewhere and he’d stay still. He’s very determined and can get himself into all sorts of positions you wouldn’t imagine. He’s managed to trap his head under the head rest of his shower chair, he slides his bum down at every available opportunity so that he slumps and he has a particularly impressive knack of leaning back or to the side to put his head under water – which wouldn’t be so bad if he’d only remember to keep his mouth shut and not to breathe in when he does it! 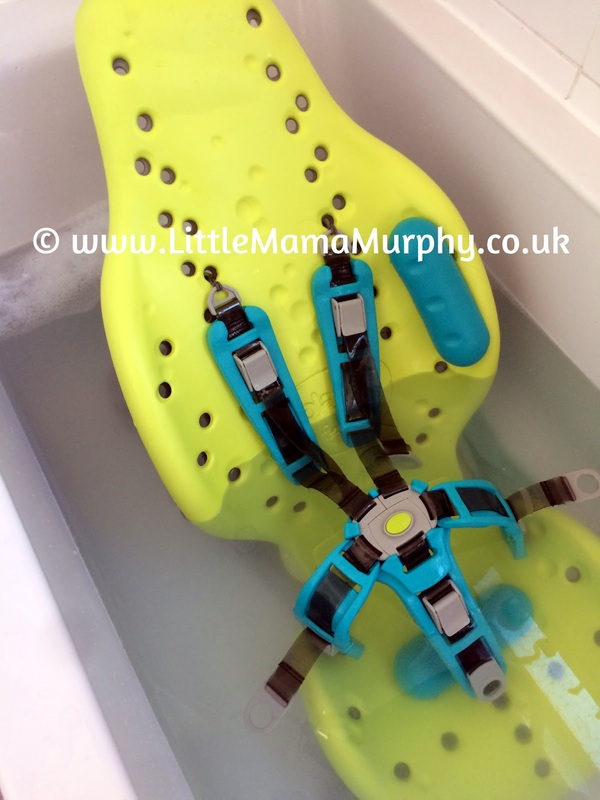 Many of the photos I’d seen online and the Splashy reviews I’d read made it appear to me that it was more suitable for children that needed minimal – moderate support in a bath chair. Hugh needs all the support he can get. That said, I was excited when the Splashy arrived. Not least of all because it meant I might be able to bath Hugh again at long last, but also because it was the first piece of medical equipment for the bathroom that didn’t look like it belonged in a hospital! I’ve complained before that for some reason companies assume that when you become disabled, or have a disabled family member, that you lose all sense of taste and style. No-one wants their child’s bedroom or their family bathroom to look clinical, yet the majority of products do just that. I cried when I first seen our bathroom after it was adapted. And they weren’t happy tears! It was cold and white and sterile looking with an ugly big ceiling track hoist and a wipe down, white, metal bed attached to the wall. In a refreshingly stark contrast to the clinical look of our wetroom, the Splashy is lime green and turquoise. It looks child friendly and fun rather than functional and frightening like some of Hugh’s equipment. (Standing frame – I’m looking at you!). It arrived in a large cardboard box with a short instruction manual, that even the most incapable of DIY-ers like myself can follow. It took around 10 minutes to put together. It recommends trying your child in it before you put them in the bath so you know you have the straps in the right place. I didn’t, because I’m lazy, but it would be easier if I had. That said, I discovered that, although a bit fiddly, it wasn’t too difficult to adjust the straps underwater one-handed either if you need to! The chair has a great recline function which we use on its lowest setting but can be adjusted for children that would prefer to be more upright. It comes with 4 bumpers which you can place wherever you want to ensure your child has the support they need. I placed one width ways along the bottom of the seat to hold his bottom in place and protect his ‘boy bits’ from the between the leg strap and one along his left side as, due to the curvature of his spine, this is the way Hugh always leans and slumps. The soft bumper keeps him more upright. It comes with a 5-point harness which can also be adjusted and positioned to suit the individual needs of your child. 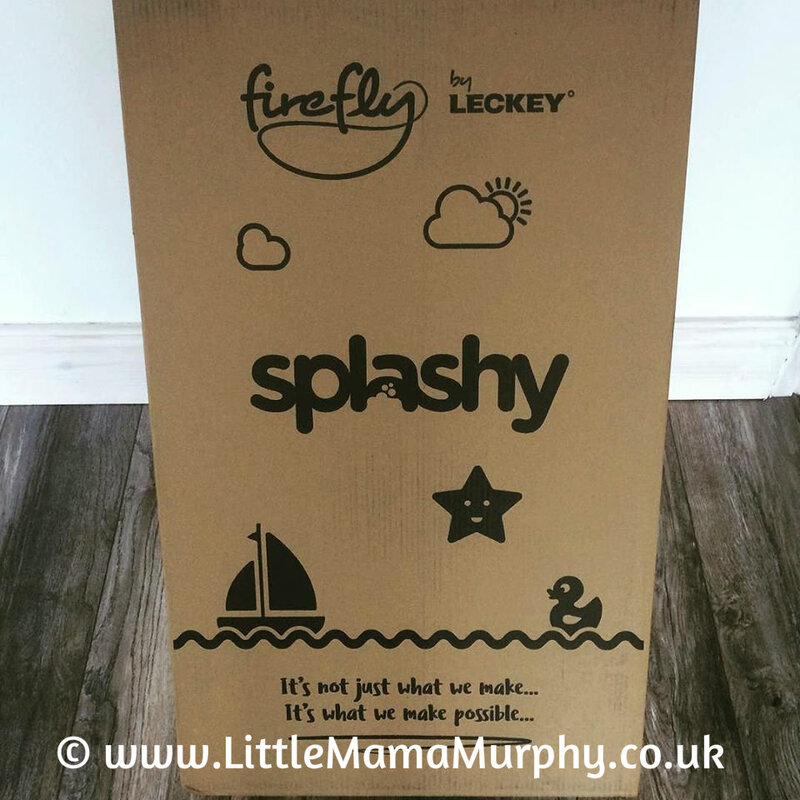 Other fab things we like about the Splashy, is that it is lightweight and compact. We were even able to take it away on holiday with us. When it’s not in use it folds us neatly and doesn’t take up much space. The seat also sits nice and low in the bath which means it takes less water for Hugh to be immersed. My water meter is pleased by that although my back isn't. I find it easier if I place a seat beside the bath to wash Hugh as I don't have to bend quite so much then. Another nice touch is that the Splashy comes with a little matching duck. Hugh doesn't seem to understand a lot of verbal communication so we use objects of reference (OOR) to help him understand. The duck makes a fab OOR for Hugh so that he knows he's going to have a bath. Hugh is 24kg (around 3 stone 10lb) and far too heavy for me to lift in and out of the bath so we hoist him in instead. Again, none of the photos I’d seen of the Splashy showed a child in a sling – I wasn’t sure how this would work. Initially I struggled to hoist Hugh into the Splashy, remove the sling from the bar, and strap him in. It involved me using one hand to hold him back to stop him wriggling into the water or headbutting the metal bar (I know from experience just how painful that is) and the other hand trying to unhook the sling and wriggle his arms into the 5-point harness and do it up. Not an easy job to do one handed. The first few attempts at bathing with the sling were a struggle – I almost hoisted the whole Splashy out of the bath once when I forgot to unstrap Hugh before attaching the sling to the hoist. Trial and error and a quick phone call to Firefly has helped me find a much simpler way: undo the shoulder straps and use the toggles to put them back in place once he’s hoisted in and the sling is unhooked. That way, I can use both hands to secure the belt around his lap, then unhook the sling and finally strap the top half of his body in. I undo each of the shoulder straps in turn when needed to wash him as well. To hoist Hugh out of the bath, I undo both straps before attaching the sling to the hoist, then undo the lap straps and hoist him out. I’ve also discovered that the little handle on the back of the Splashy is ideal for hooking the hoist control into. (Obviously only do this if your control is waterproof like ours). 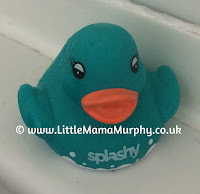 Bath time is so much easier and much more fun for Hugh now we have the Splashy. He enjoys stretching his legs out and kicking in the water. It’s simple and easy to use, even with a hoist and sling, and Hugh sits safely and comfortably in it too. My only real concern is that it won't be long until Hugh outgrows it and, as yet, there is not a larger model available. Overall though, we’re really happy with it and would highly recommend it. Disclaimer: I was provided with a free product in return for my honest review. All thoughts and opinions expressed herein are my own and not influenced by Firefly. Fingers crossed. Apparently lots of people have expressed this wish so hopefully they’ll make a larger model. We won’t be in this for very long- not the way Hugh is growing! Aw that's brilliant to know it's practical with the hoist! So glad Hugh is getting to enjoy his bath again!